Introducing the RideTrails.Org Affiliate Mall! RideTrails has recently made some upgrades to how we manage our supporter Advertisements on RideTrails member sites. This upgrade will allow us to update your site’s advertisements more frequently — and hopefully provide your membership with more-targeted offers that meet their needs. In doing so, we have created what we call our “Affiliate Mall” on all RideTrails.org sites. This section appears on your “Sponsors” Page at near the bottom. 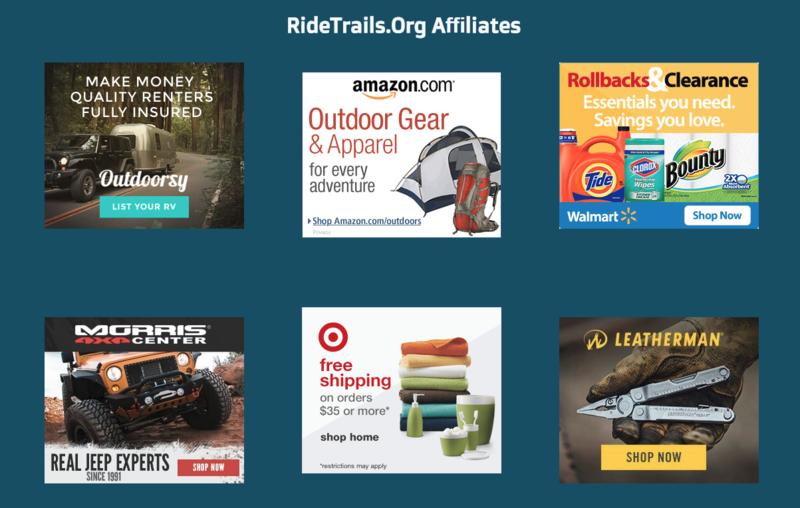 The Affiliate Mall provides links to online retailers that provide the RideTrails program with a percentage of sales that are initiated through the links. These commissions range from 1.5% of the sale all the way up to 10% (depending on the retailer and the items purchased).Rather than attempting to find every affiliate possible, we are only placing affiliates that may be of interest to your members. Typically these will be companies that are either large retailers or sell products related to outdoor recreation, motorsports, or automotives. We are working on getting Cabela’s added as a new affiliate; we will update your pages if and when they join us! If you or your members have a favorite online retailer that you’d like to see featured, let us know! Advertising revenues enable us to keep providing our services to you! Please share this information about the Affiliate Mall with your members! Previous Post: Feature Events on Your Home Page!